Thailand is supposedly the land of smiles. I found this to be true in some respects but it was clear that their culture had literally been raped by the influx of western tourists. After spending some time there and cutting through the standard tourist garbage, I managed to find the old Thailand. A Thailand that few western people bother to go and see. I had always been fascinated by monks that had tattoos. In the western world this would be a complete oxymoron, but to the monks of Thailand it is something that is highly prestigious. I set off to the famed Wat Bang Phra to find out more about the process behind the tattoos and the meanings associated with them. After managing to find Wat Bang Phra, written in Thai on the Internet, and getting someone Thai to write it down for me, I set off on a mayhem of public transport. The temple is located about an hour or so from central Bangkok and was not THAT difficult to find, my tiny scrawled bit of paper seemed to do the trick! The final bit of my journey was by tuk-tuk. The temple was not really as I had imagined. It was very open and modern looking but also had an air of antiquity. I assumed that it had just been very well looked after. Almost the first thing I ran into was a monk sharpening his tattooing stick, so i knew I was in the right place. As my Thai is fairly shocking, it was difficult for me to ask him where to go or what to do.... So i walked around a bit more and tried to find a Monk that spoke a little English. Eventually I found what I was looking for. I was greeted with an enormous smile and beckoned inside a large room, filled with statues. 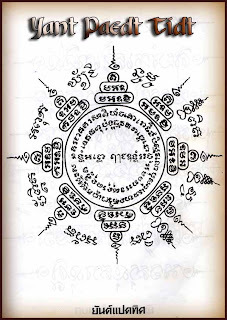 It is a Buddhist compass called Paed Tidt. 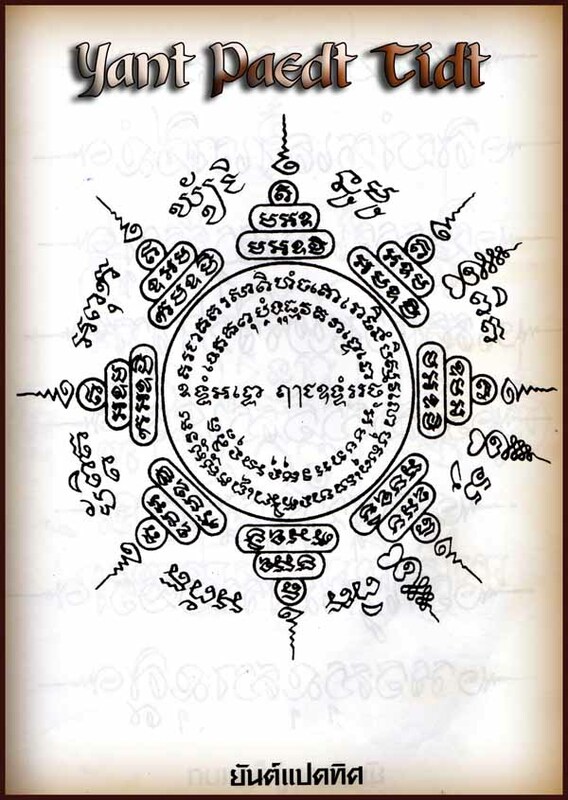 The three tiered oval shapes represent a seated Buddha and there is one for each cardinal point. This means I gain protection from Buddha in which ever direction I travel. I was overjoyed as this was exactly what I wanted and the fact that he could tell that from my persona made it even more special. Preparations were made and we began. Firstly I had to present an offering to the monk, some flowers, a packet of cigarettes and a fiscal donation were hastily got for me by a lay person and then I made the offering. Some time was needed for reflection and the monk to prepare the implements. He sharpened up his tools and we began. The pain was immense. For some reason I found this even more painful than that of the tattooing sticks in Borneo. Maybe its because it was a double pointed and fairly large stick, or maybe it was because it was right on my spine, but I was certainly aware of how much it hurt. Unusually, there was no outline done, no markings of any kind, he just went straight on with it. It became obvious later on that he knew every single tattoo off by heart and didn'tneed any templates for any of them. You can see the various stages below. In the video, right at the end you can actually hear him sharpening mid tattoo. As soon as he had finished (the pain stopped which was nice haha) he flicked oil onto the tattoo, said a prayer and then exhaled onto my back. This is supposed to install the magic of the tattoo under your skin so that it remains with you forever. As he did this i felt an odd tingling sensation around and on the tattoo and felt very relaxed. He then insisted that he got a monk higher up in the order to come and bless me again. The process was similar, more oil, a prayer and then exhalation into the open skin. Again I felt a calming effect and knew that I had received something special. I eventually decided it was time to be on my way. I thanked the monk from the bottom of my heart and went to leave. He stopped me mid stride and handed me the tattooing implement. I thought it was another ceremonial act, bowed to it and then handed it back. He turned me round, opened up my bag and slid it inside and then winked at me. I felt extremely privileged as, from seeing the others getting theirs done, this was not customary. He then led me out and into a room where the mummified remains of the famous Luang Por Phern rest. He is the person that made religious tattoos so famous in Thailand. I was encouraged to say a little prayer and then was walked to the nearest bus stop. This again had been a journey that had taught me not only about a different method of tattooing, it had also taught me about other things too. I had learnt more about myself, but had also gained a unique inside into a world that is (once again) a far cry from anything we have in the west. I finally felt attached to Thailand, the real Thailand.